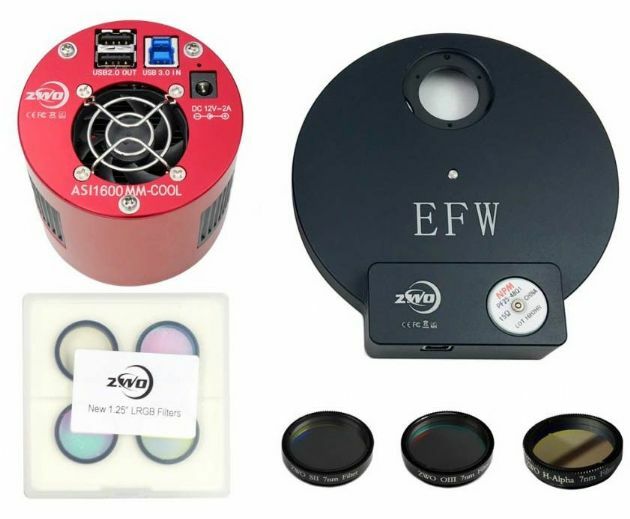 ZWO has packaged the popular ASI1600MM-PRO COOLED Astronomy Camera with their NEW 8 -position 1.25″/31mm Electronic Filter Wheel, their 1.25″ RGBL Filter Set and their latest development, the 7nm H-alpha, SII and OIII 1.25" narrow band filter set. These filters have been designed specifically for this camera to maximise the output of the camera. The RGBL and narrow band filters greatly complement this camera, thus making it the perfect set up for deep sky imaging! The 256MB DDR memory buffer is the main difference between the previous ASI1600 “Cool” and the latest “Pro” cameras. Whilst the original ASI1600MM-COOL is a perfectly capable USB3.0 camera, those who wish to use it via a USB2.0 port, can now do it with better success as the addition of the 256MB DDR3 memory buffer means more stable data transfer even at the lower speed of the USB2.0 port, plus reduced amp-glow for the same reason. The ASI1600-PRO uses 4 screws to seal the chamber. This structure has been fully tested and is very stable and reliable. Even under high humidity eviroment, ASI1600-PRO still works fine and won’t have dew problems. The ZWO ASI1600MM-PRO COOLED camera is an excellent choice for imaging deep sky objects, however it can do much more than that. 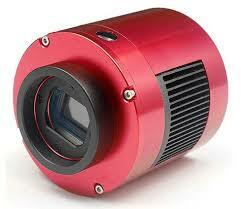 With a max framerate of 23 FPS this camera can also be used as an extremely high resolution planetary imager. If you cannot decide if your thing is deep sky or planetary imaging, go for this camera. It is also a much more affordable alternative to converting a dSLR. The ASI1600 features a built-in 12bit ADC, but can also provide 12.5 stops dynamic range which is even better than the competing KAF8300 sensor dew to its super low read noise, so it could be a good alternative to much more expensive professional CCD cameras. This version also comes with built-in active cooling that helps to reduce electronic noise to the minimum. Colour or monochrome and cooled or uncooled. Now you will have to decide whether you want a simple solution and go for a one shot COLOUR CAMERA or would like to get more data out your camera and go for the MONOCHROME version. If you would mainly use it as a deep sky imager camera, we'd also recommend to go for the COOLED version, but if you cannot afford or you'd be mainly using it as a very high resolution planetary imager, then go for the UNCOOLED version. This product listing is for the COOLED MONOCHROME version of the ASI1600. Why not to try L-RGB or narrow band photography with the monochrome version of this camera, the ZWO ASI1600MM or ZWO ASI1600MM-PRO. If you are not in rush, but you'd like to get out the best result from your camera, this monochrome version is the right choce for you, although if you are on a tight budget, you could also consider the UNCOOOLED version instead. Earlier calculations were approximate figures as those were based on assumptions rather that precise measurements as at that time we did not yet have the new filters and electronic filter wheels in stock. Exposure range: 32µs - 2000s! Built-in RAW mode and Grey mode output support. Only about 30% storage space required compared to the Color data format! 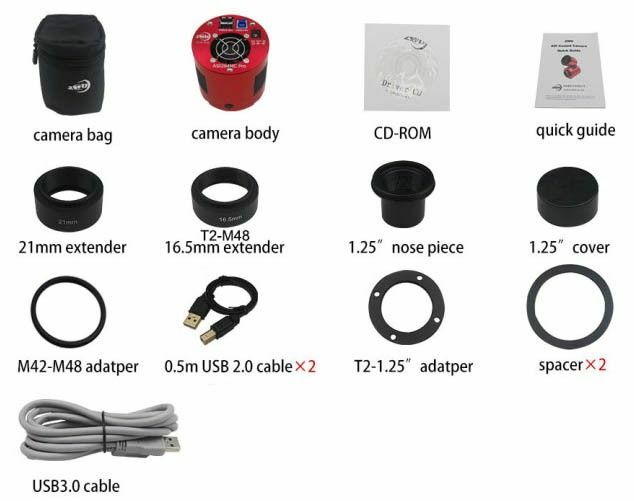 due to the large sensor size, the usual 150 degree wide lens IS NOT included as it is not compatible, but there might be some other compatible lenses that would work with this camera. If you know about such lens, please let us know, so that we can share it with other users as well.